For many teens, summer time means relaxing, traveling, and fun in the sun with friends. For others, summer means sitting around for 3 months with nothing but watching tv, playing video games, and staring at their phones all day. If that sounds like your teen, then it is not too late to change that habit! It's important to have some summer activities for your teen so that they do not have any "summer brain drain". This just means that if your child does nothing academically or mentally challenging for the months out of school for summer break, then it is likely that they will begin to slowly lose the academic information they learned this past year. I think it is vital for teens to have 3 important activities this summer! Writing is a skill necessary for academic success! If your teen goes from writing essays every week in school, to writing nothing for months, then it is likely that they may lose certain writing skills, and revert back to a lesser writing ability. This is why I encourage students to keep a summer writing journal! By keeping a writing journal, you can encourage your teen to write in it for just 30 minutes a day. You can choose simple and fun writing prompts each day to provide your child with a creative outlet and a mental challenge. Writing a little each day can help retain and improve their writing ability. If you would like summer writing prompts for your child, I have a free summer writing workbook just for you! Click the button below to receive the workbook with writing prompts for the entire summer! Reading is also the perfect summer time activities to help your child retain their academic level by keeping them mentally challenged. Try to take your teen to the library and encourage them to take as many books as they'd like. For the summer, you can set a schedule of reading for at least 30 minutes a day. If your child or teen is resistant towards reading, or just simply does not like to read, then you can help them find the type of book they may want to read. Get them books that they would want to see the movie! For example, If your child loves mystery or crime tv shows, then you can get them that type of book. If your child loves a robotics class, then find a book about robotics. If your child loves sports, find them a biography about a professional athlete. Try to peak different likes and interests to get them to enjoy reading and inspire a love for reading! I am a firm believer in having teens and preteens get a summer job! Now, before you think I'm crazy, here me out. I think all teens should work a minimal amount, about 2 to 3 hours per week. How can that work, you may ask. It is very difficult for teens and preteens to find an employer to hire them for the summer, because most college students coming home for the summer have taken all the jobs. So how can a teen get a job? Every teen can work for themselves! They need to find work they can do and find their own clients to hire them. For examples, teens can mow the lawn, babysit, event planning, wash cars, paint walls inside houses, dog walk, pet sit, etc. Having a summer job teaches discipline, responsibility, hard work, and financial management. I started my first business at 11 years old. I mowed a few lawns each week, and earned about $15 an hour. I was SO excited to be making my own money! It taught me the value of hard work, and that I can count on myself to get the job done. This value translated over to my school work, as I learned to work hard, and that it was only up to me for my grades. Have your child pick a job they do well, and help them find a client that is willing to hire them weekly. At 11 years old, I found my clients by seeing who in the neighborhood was paying a big lawn care service company to maintain their lawns, and then offered to do the job for less money. Most adults are willing to pay a teen because they are young, and they want to encourage them to work hard. Having a summer job is also a great way to help your child financially prepare for college. College is very costly! And even if you plan on paying for their tuition, there will be other costs that they need to plan for. For example, books, school supplies, dinning facility, dining out, extra curricular activities, etc. 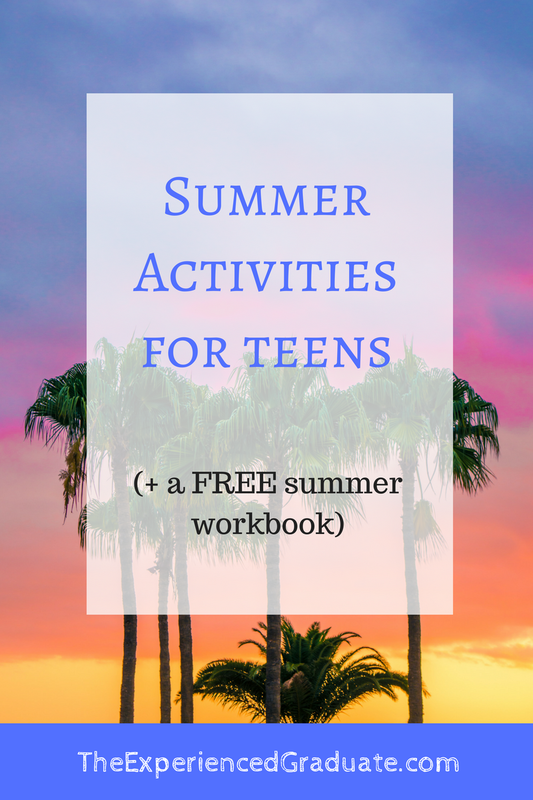 What kind of summer activities are you going to implement for your teen this summer? Leave a response and let me know! I'd love to hear all about your teen!